NORMAL, AL – History was made on Saturday as the Texas Southern Lady Tigers basketball team captured the programs’ first Southwestern Athletic Conference regular season Championship in school history defeating Alabama A&M 72-56. Texas Southern head coach Cynthia Cooper-Dyke captured her fourth conference championship in her impressive collegiate career. 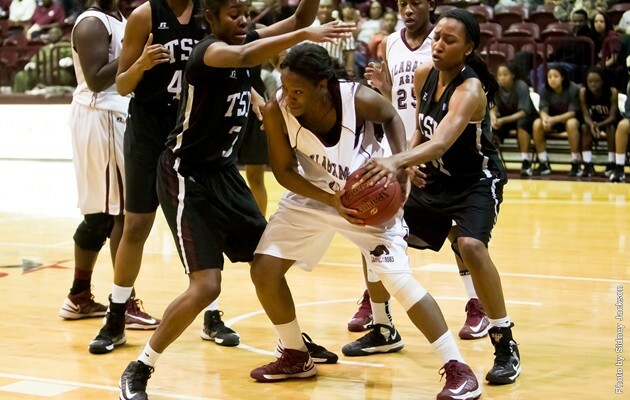 With the win the Lady Tigers also subsequently clinched the number one seed at the 2013 SWAC Basketball Tournament. TSU was led in scoring by freshman sensation Te’era Williams. Throughout the duration of the game Williams was a constant offensive scoring punch for the Lady Tigers as she scored 25 points marking her new career high for points as well as a new season high for the team. Kayla West added 16 points along with fellow teammate Brianna Sidney as the Lady Tigers were hot from the field shooting 67 percent in the first half (14-22) and 57 percent for the game (26-45). Texas Southern pushed their season win total to 17 and have won 14 consecutive games in conference play. Texas Southern grabbed their largest lead of the contest at the 1:07 mark of the first half leading AAMU 42-20. Texas Southern outrebounded Alabama A&M 40-29 while also outscoring them inside the paint 30-22. Williams went 8-of-13 from the field while also connecting on 9-of-12 free throw attempts she also led all player in minutes played with 34. Texas Southern will get set to face Alabama State on the road on Monday at 5:30 pm. The Lady Tigers will return home on Thursday as they are slated to host Southern on Thursday, February 28 at 5:30 pm at H&PE Arena. Texas Southern clinched the number one seed at the 2013 SWAC Women’s Basketball Tournament in Dallas. Head coach Cynthia Cooper Dyke is now only 3 victories shy of reaching 150 wins as a head coach. The Lady Tigers have now won 14 straight games dating back to Jan. 4. *Texas Southern has set new school records for consecutive wins (14) and overall wins during the regular season (17).